In this video, we are going to apply inverse variation. First, let’s discuss direct variation. It is basically proportions. The number of gallons of gasoline is in proportion to the number of miles. Inverse variation is the opposite of direct variation, where the increase of one meets the decrease of the other. 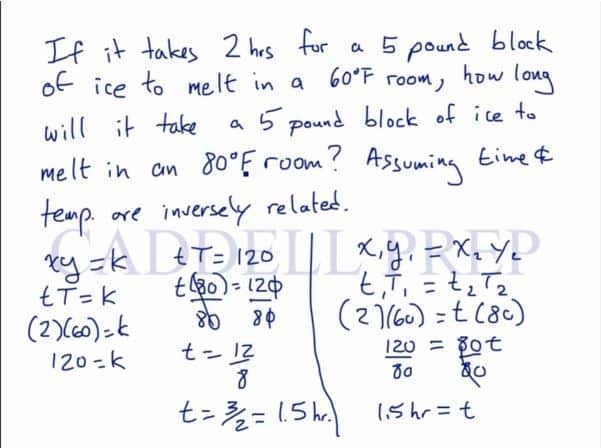 If it takes 2 hours for a 5-pound block of ice to melt in a 60-degree Fahrenheit room, how long will it take a 5-pound of ice to melt in an 80-degree Fahrenheit room, assuming time and temperature are inversely related. Let’s go over inverse variation. First, let’s talk about direct variation. A direct variation involves proportions. But they always divide and equal to the original number. Notice that when miles go up, gallons also increases. Likewise, when miles go down, gallons used will also go down. Now, inverse variation is the opposite. In this case, if goes up, should go down. And when goes down, goes up. Just like in direct variation where you have proportion, in our example miles travelled over gallons used. Here, we can use miles travelled to gallons remaining. If you drive far, the number of gallons left in the car is going to go down. It might not match this equation but this gives you a better idea of what inverse variation is. When one goes up, the other one goes down. This example isn’t necessarily factual, we’ll just use it to demonstrate inverse variation. If it takes hours for a pound block of ice to melt in a F room, how long will it take a pound block of ice to melt in an F room? Assuming time and temperature are inversely related. This makes sense because when the temperature goes up, we expect that time it takes to melt to go down. Likewise, when the temperature goes down, we expect it to take longer for it to melt. We can solve this in two different ways. Either way, we will get the same answer. Let’s use the first method first. Now, let’s look at the second part where , and we need to find how long will it take to melt if the room is F.
Now, let’s solve for time. Now, let’s solve using the second method. We’re not going to solve for the constant here, we’ll just go straight into the equation. At this point, we have the same step with the first method. So if you have two situations, the product of one situation should equal the product of the second situation.